I read the article about Amazon, shared it with my biz partner, and was just appalled by what current and former employees stated about the firm. I have a friend in Seattle who decided not to buy from Amazon again after hearing about the warehouse (think it’s in PA) that wasn’t air-conditioned, until employees complained about it and it reached the press. I debate about not using Amazon and actually just ordered your new book, through Amazon and re-ordered the paperback version of your first Shift book (need encouragement!). Amazon has just become so big and yet with so many reasonable prices and features, that I wonder if I can break buying from them. Maybe if/when another firm becomes like Amazon, I may change. So many small businesses (and of course, large) rely upon Amazon for not only showcasing and selling their product(s) but also their fulfillment business services. I plan on using that service when I launch my product at the end of the year. It’s almost you can’t live with or without them. I will continue to be a long-time amazon.com Prime customer. I read the article and know many people flourish in a high-pressured environment like amaxon.com or many Wall Street financial firms or large, competitive law practices. 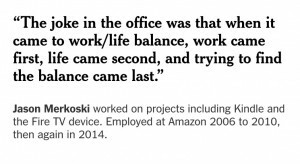 Most importantly, my sister works for amazon.com and says it is the best job she has ever had in 40 years. Yes, it definitely impacts. While the impact of such information may not be seen immediately, consumers are increasingly more conscious of organization’s social-environmental practices that detriments society. The article re Amazon confirms my decision to not do business with them. I have not liked Jeff Bezos’ comments even when he was first getting the company started. It was clear then he cared about nothing other than himself. I have never done business with them, and certainly will not change that now. Yes it does. As I’ve gotten older and reflect on my life I’ve started to daily make decisions that reflect the beliefs and principals I live by no matter how small or seemingly insignificant it may be. So hearing how Amazon thinks about and treats its workers and the culture it allows/promotes, it’s not a company I will shop thru or recommend no matter how easy, inexpensive and convenient it may be. After reading the NYTimes article yesterday, I am no longer buying ANYTHING from Amazon. I sent the article to numerous people, who have large email lists; and today, many asked me how was I going to shop? My response: you can go directly to the site of anything that’s manufactured in the U.S. and buy from the original “maker.” Yes, I, too, feel inconvenienced; however, would I buy goods from North Korea – a country that starves its citizens and breaks up family units in the most horrifying ways? OF COURSE NOT!!! Would I buy products from a Nazi slave camp? OF COURSE NOT!!! The procedures, described by employees, reek of the worst form of bullying, confidence destruction, harassment, and gender discrimination. Furthermore, employees are goaded into and rewarded for the lowest common denominator human relations, employee relations, and simply ignore the ideals of compassion and humanity. Bezos has only one religion – worshipping his corporation. I am shocked, disgusted, and sadly disappointed. Corporations truly are the dinosaurs of our epoch – they have small brains, too many cells to make function efficiently, and will implode as they destroy both our humanity and planet. Let’s just hope SOME life forms can outlive these monstrous corporate behemoths. Yes. I will no longer buy from Amazon. It doesn’t necessarily impact my decision to buy through Amazon as long as the customer service and prices are good. It is the employer’s right to run the workplace they see fit as long as they are paying wages and benefits within the confines of the law. It’s not like Bezos is asking people to work in the fields for $1.00/day. I am proud to live in a country where choices exist. HOWEVER, it is also the right of employees and prospective employees as to whether or not they want to work in a toxic workplace such as this one. This is not prison. Amazon is huge. If every disgruntled employee who works there now or in the past tells two friends and so on and so on, eventually Amazon will suffer a labor crunch, customer service will decline and they will topple. Then I will buy from the next great retailer to hit the market. I believe this is capitalism. Hi Tory, To those employees I say, try being a vendor. Yikes! I am and Amazon is very difficult to work with. Fees, hidden charges, bad communication…. the list is endless. It is hard finding good employees and with companies that have so many workers it’s often hard to find loyal employees as well. I do think the CEO should investigate what in the company is creating this climate (if intact this is not just a rogue employee). If identified try and fix it. The fact is laws and regulations do not make it easy to run a business in this country. That being said employees have the choice to leave. What might be a better recommendation is being proactive and finding ways to improve the environment as an employee instead of complaining. Companies like creative thinkers. Yes, it does. I am a fan of companies that create humane workplaces. With high rates of unemployment, employers are in the best position to hire or fire anyone they wish at any time. In this environment, I am stunned by the responses of people who say that unsatisfied Amazon employees should “just get another job”. Finding a well-paying job is challenging in many parts of the country. For people who are supporting families, parents in long-term care, or children with disabilities, it is not possible to leave a job without another equally well-paying job lined up. The New York Times article pulled the lid off of a company culture that many people, outside of Seattle’s tech community, did not know existed. I didn’t know. Going forward, I will search high and low in local businesses for products that I would normally buy through Amazon. I am willing to wait longer for those products to be delivered as well. I thought that Amazon was a good company with good values. The New York Times article just illustrated that Amazon does not value its most important asset: The employees. Can you edit typos? I just realized that I wrote off off. There should be only one “off”. It’s been taken care of for you! I am an Amazon Prime member and yes i am considering discontinuing my membership. I will take my business where employees are valued and positive relationships are celebrated. I have not purchased anything from Amazon in at least two years because I was appalled by their predatory marketing practices. The NYT article stiffened my resolve. Jeff Bezos strikes me as a megalomaniac who wants too control everything – the market, the employees, and possibly the world.